We are conducting planned maintenance on the SDO website. There may be outages or interrupted service. We apologize in advance for any inconvenience this may cause and appreciate your patience. Another New Year is upon us and it is time to plan the next set of SDO calibration maneuvers. This includes the leap second that needs to be applied just before January starts. Why do we care about leap seconds? SDO moves about 3 km each second (about 1.9 miles every second). So does every other object in orbit near SDO. We all have to use the same time to make sure our collision avoidance programs are accurate. So we all add a leap second to the end of 2016, delaying 2017 by one second. Today starting at 1700 UTC (1:00 pm ET) SDO will perform the EVE Cruciform calibration maneuver. 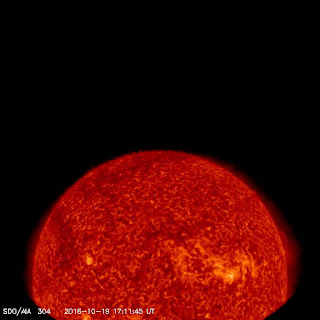 Next week, on October 26, 2016, SDO will perform the EVE Field of View calibration maneuver at 1315 UTC (9:15 am ET) and the HMI/AIA Flatfield calibration maneuver at 1630 UTC (2:30 pm ET). During calibration maneuvers SDO science data may be unavailable, blurry, or otherwise not usable. On the other hand, the images can be fun to look at! At left is an AIA 304 image showing how SDO is tipped up a little during the first leg of the cruciform. On October 30, 3016, SDO will experience a Lunar Transit between 1956 and 2056 UTC (3:56 and 4:56 pm ET). The Moon will cover about 59% of the Sun at the peak of this transit. A Beautiful Joint Solar Eclipse! 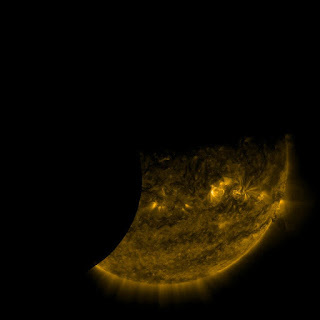 Today's Joint Solar Eclipse looked beautiful from SDO. Here's a short movie in AIA 193 to show you what it looked like. It starts with the Earth between SDO and the Sun. As the Earth moves out of the way, you can see the disk of the Moon covering part of the Sun. The wobbling of the Sun is due to SDO turning off the fine-guidance system during the Earth eclipse.  Meanwhile, solar physicist Ryan Milligan was traveling in Tanzania and saw the eclipse from the ground.  Here is a lovely picture of an annular eclipse — not quite total, but better than partial. This picture is a excellent example of a "Ring of Fire". The different views of the Sun, SDO seeing a partial eclipse of the Sun by the Moon while parts of Africa saw an annular eclipse, come from SDO's position to the East of Africa, a little North, and far out in space. Thanks to Ryan for letting me show his post. You can see more of his eclipse pictures at https://twitter.com/ryanomilligan. Today at 1857 UTC (2:57 p.m. ET) SDO will do MM #27. Science mode will stop at 1847 UTC and resume at 1917 UTC (3:17 p.m. ET). Science data may be blurry or absent during that time. Tomorrow morning between 0715 and 0731 UTC (3:15-3:31 a.m. ET), SDO will see a lunar transit as SDO exits an Earth eclipse. Parts of Africa will observe an annular solar eclipse at the same time. While these double eclipses were rare early in the SDO mission, two have happened in the last year. The SDO flight dynamics team cannot yet tell whether we will see another one next year. Even though the Sun and Moon loom large in our images, they are actually quite small and SDO's view may have the Moon outside of the Sun next September. Enjoy the 2016 SDO Joint Solar Eclipse! Today from 2240-2305 UTC (6:40-7:05 p.m. 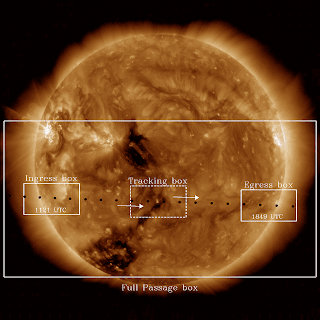 ET) SDO will execute a station-keeping maneuver that keeps us within our assigned longitude box. The instruments may return data during this time, but it could be blurry. Looking forward to September we have another lunar transit on September 1, 2016 from 0715-0731 UTC (3:15-3:31 a.m. ET). This transit will start while SDO is in the shadow of the Earth. That means when we see the Earth move out of the way the Moon will be covering part of the Sun. While these double transits did not happen the first 5 years of the mission, we may see a couple more as the Moon's orbit slowly shifts. Here is a movie from the flight operations team showing the double transit. On August 31, 2016, SDO will perform the EVE field of view and HMI/AIA Flatfield Maneuvers. More on that later. You Never Miss Them 'TIl They're Gone! I had forgotten how nice it was to see the Sun each morning in all of the different ways SDO provides. It took longer then we expected, but as of the end of the Friday work day, SDO is in science mode and all three instruments are returning science data. AIA is currently taking images with the nominal 8 images every 12 second program but it is running an older version of flight software that is affecting the Image Status Packet. We plan to leave the system in this configuration over the weekend. It's been a long week for the SDO team and I hope they can return Monday ready to fix the remaining issues. Thanks to all who helped SDO to return to operations. SDO had a lunar transit this morning from 1113-1207 UTC (7:13-8:08 a.m. ET). The spacecraft did not go back into Science mode at the end of the transit. SDO FOT members are looking into the issue. SDO will perform an EVE cruciform maneuver today. From 1700-2152 UTC (1:00 p.m.-5:52 p.m. ET), SDO will rock up and down and back and forth as a calibration maneuver. During this time the AIA and HMI images may be blurred or blank. 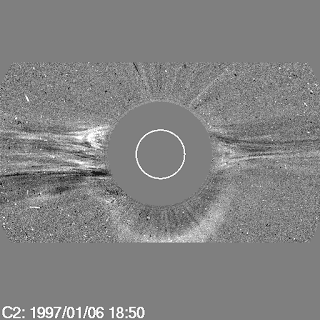 SDO will perform momentum management maneuver #26 today from 1945-2000 UTC (3:45-4:00 p.m. ET) today. Science data is not returned during the maneuver. We are starting the July maneuver season. Today is the HMI roll maneuver from 1500-2000 UTC (11 am ET to 4 pm ET). During the roll the Sun will appear to flip in the NRT data. This data is used to maintain the calibration of HMI and to study how round the Sun is. Earlier the week we received our conjunction report that lists satellites that will pass close to SDO. Our inclined geosynchronous orbit means there aren't a lot of satellites near SDO, but every couple of months one will come within 20 km (12 mi) of our spacecraft. This week saw the return of Telstar 401 to our list (see the picture at left.) 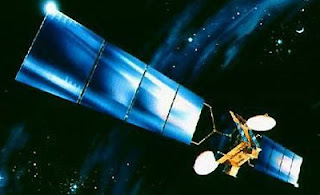 Telstar 401 is a large telecommunications satellite that failed January 11, 1997, and has since drifted around the geostationary belt of satellites. This is not a small satellite, the solar panels stretch about 60 ft across. It's good to know the other satellite is around, but it would be better if was moved to a graveyard orbit well outside of the geostationary belt. It is possible that Telstar 401 failed because of the activity created by a coronal mass ejection that rose off the Sun on January 6, 1997. 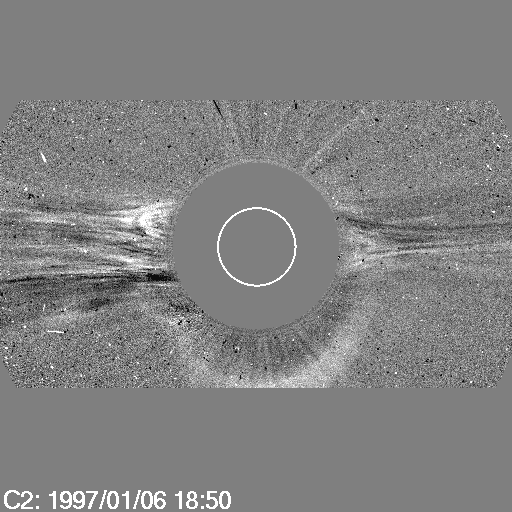 (The gray picture at left shows what the CME looked like at 1850 UTC on that date.) 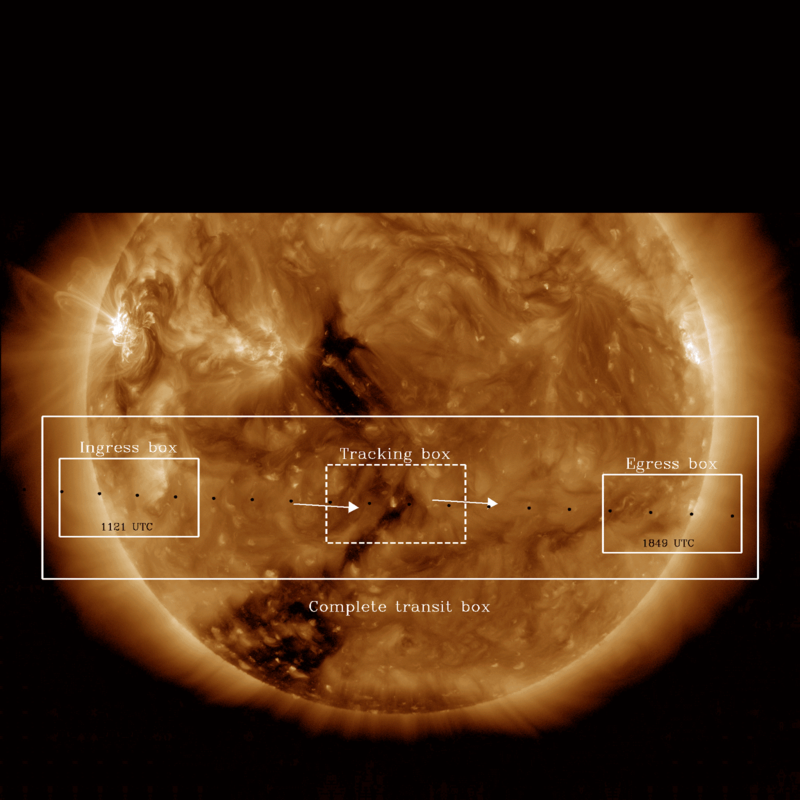 The CME is the white arc moving down from the occulting disk. It is called a halo CME because we see it as a ring around the Sun, which means it is heading straight towards Earth! The impact of the CME was not very dramatic when it reached Earth a few days later. But the energies of the radiation belt protons and electrons were increased enough that they caused an electronic component to arc and fail. There were several attempts to revive Telstar 401, but it was eventually declared a loss. According to the Union of Concerned Scientists, there are almost 500 satellites currently operating in geosynchronous orbits about the Earth. Most of them are in the geostationary belt that allows them to appear stationary in the sky. There are about 100 defunct satellites in graveyard orbits further away from the Sun. But it is the failed satellites and spent boosters that blunder along and show up on the SDO conjunction report every month or so. Telstar 401, a true ghost of space weather! Celebrate the Summer Solstice with Cool Pictures of the Mercury Transit! Today at 2234 UTC (6:34 pm ET) is the summer solstice for 2016. It's also a full moon today, the first time the summer solstice and full moon have coincided since 1967. Enjoy the longest daytime of the year and a bright night as well. Maybe we could celebrate the brightest day of the year? Today I would like to share another picture from the May 9, 2016, Mercury transit. This is a composite created by Monica Bobra at Stanford University. It's an excellent view of the transit from 2nd contact to 3rd contact, with an image every 20 minutes. Creating these composites takes a good bit of art. You can't just add the images together as that blurs the background image of the Sun. You have to take cutouts around the planet and reinsert them in a selected background image. It turns out that MDI on SOHO was turned on for the transit. Bobra did the same analysis to produce this image from MDI. The data near 2nd contact is not available. You can see the paths of Mercury are slightly different in the two images. The MDI path is closer to the solar equator and tilted at an angle to the path in the HMI image. These differences are caused by the different viewpoints of the transit from the two spacecraft. Similar differences are what were measured to determine the size of the astronomical unit (AU) during the Venus transits of the 1700 and 1800's. The HMI operators restarted HMI and science data is flowing. Many thanks to the LMSAL team! HMI has thrown an error. The HMI operations team is working to bring the instrument back online. No data will be available until the instrument is fixed. On Wednesday, June 1, 2016, the EVE calibration rocket flew high above the New Mexican desert. The instruments all returned good data and the payload was recovered for another flight in a couple of years. Congratulations to the EVE team for re-flying the payload after last year's lunch problems. Thanks to the Wallops flight crew and the White Sands Missile Range personnel who actually do the launch and recovery. On May 9, 2016, Mercury passed directly between the Sun and Earth, making a transit of the Sun. Mercury transits happen about 13 times each century. NASA’s SDO studies the sun 24/7 and captured the entire nine-hour event. This composite image of Mercury’s journey across the Sun was created with visible-light images from HMI on SDO. Image courtesy of NASA/SDO, the HMI Science Team, and Genna Duberstein. It's always nice to see stories using SDO images on the web. It was pretty cloudy on the East Coast of the United States on Monday and a cloud-free satellite feed is a great backup. Here are a few examples where SDO images were used to share the Mercury transit to the world. http://www.nasa.gov/topics/solarsystem/features/eclipse/index.html (Of course!) 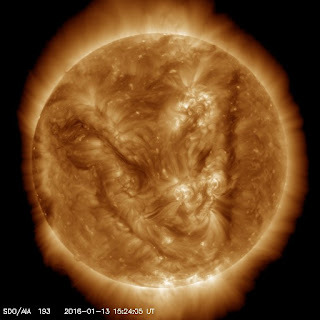 Lots of stills and movies from SDO, including the composite image at the top of this post. 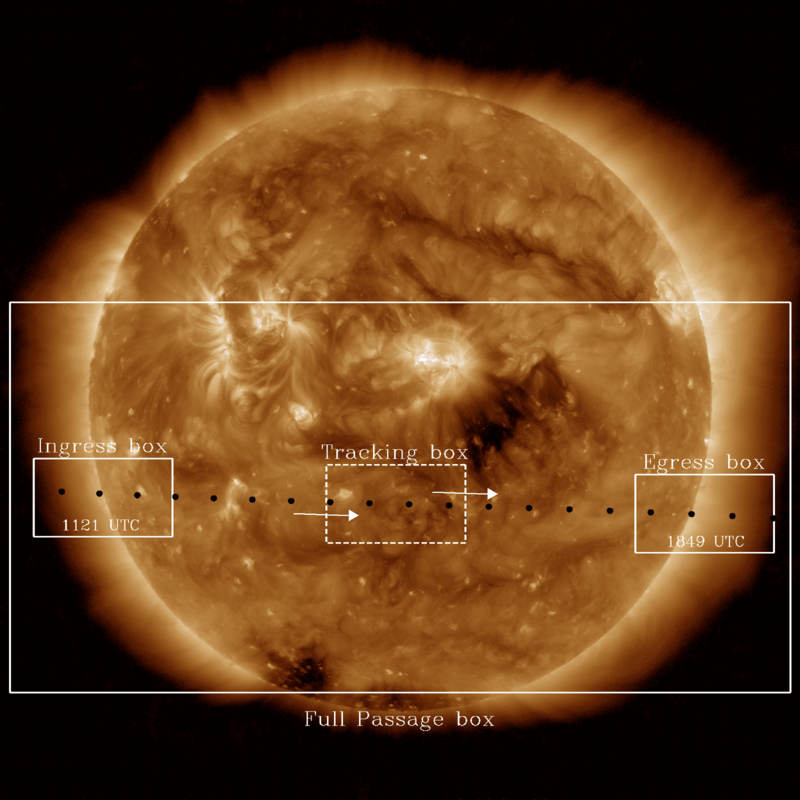 SDO will now return to its regularly scheduled observations of the Sun — in better than UltraHD! I am glad so many people could watch the Mercury transit yesterday, with SDO and from the ground. People around the world were watching the transit along with SDO! Here is my favorite view of the transit. An AIA 193 movie of Mercury passing over a small but active prominence as it moves off the disk of the Sun. The mp4 movies of the transit will be archived at http://mercurytransit.gsfc.nasa.gov, so you can look at the phases and wavelengths you missed the first time. Many thanks to the people at Stanford University who got up at 3:00 am PT to start the scripts to provide the SDO data. My thanks also to the people at the Goddard Space Flight Center who worked all morning to keep the data flowing and help with the network configuration. Now I can relax and start looking forward to the next transit of Mercury on November 11, 2019. But first you should watch for the Great American Eclipse, a total eclipse of the Sun on August 21, 2017. The path of totality of this eclipse spans the continental US, so it can be seen by almost everyone in the USA who can drive a few hundred miles or less. SDO won't see this eclipse and I will just be another person jostling for position at some place along the path! Mercury has moved off the Sun but can still be seen against the corona. Mercury is nearing the far edge of the Sun, or 3rd contact. It will pass over a nice prominence! The network seems less overwhelmed now. Here is a movie from the 1600 channel showing Mercury up to mid-transit. We are being overwhelmed by requests for images of the Mercury transit. We are working to speed up the network access and send the data smoothly to your browser. The Mercury Transit is Tomorrow! Tomorrow at 1030 UTC (6:30 a.m. ET) we will begin watching Mercury move into view against the corona of the Sun. This is about 45 minutes before it is visible against the Sun from the ground. 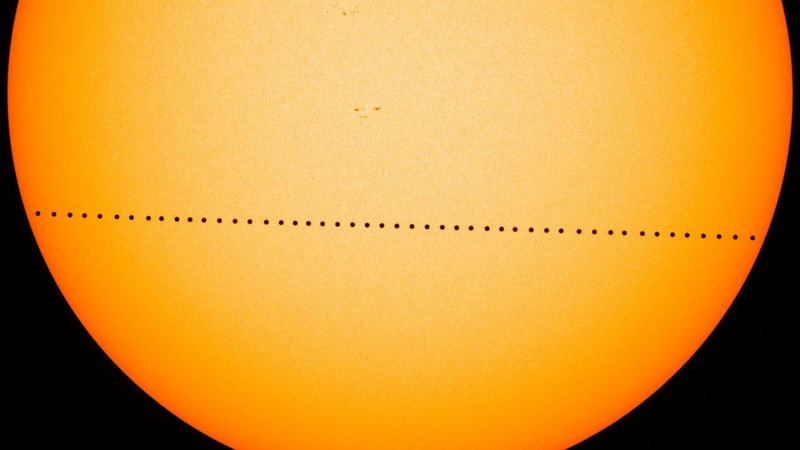 We have created http://mercurytransit.gsfc.nasa.gov to let you watch this transit as short movies in almost real time. The image at the left shows the predicted positions of Mercury against an AIA 193 Å image from 1414 UTC May 8, 2016. The black circles are about the size of Mercury and are spaced 30 minutes apart. There are no sunspots along the path of Mercury and only a few areas of strong magnetic field (the bright regions in this image). Only active region 12542 has a noticeable area and it is at 11° N, well above the path of Mercury. The corona is also smaller than it has been, meaning Mercury will come into view in the EUV images less than an hour before 1st contact. Although we will be taking images all the time, the special modes will start 45 minutes before 1st contact and end 45 minutes after 4th contact. Along with the full-disk view of the Sun we will provide several zoomed views. These views are shown by the boxes that are drawn on the image. You can also see that the EUV telescopes will see Mercury blocking the corona before it moves onto the disk. All of the boxes are built in a 16x9 ratio that nicely fits into an 1080p screen. The Full Passage box will be updated throughout the transit so that you can watch the entire path of Mercury across the Sun. Each view is available as a self-updating movie, by clicking on the picture shown on the website, and as an mp4 movie, which can be seen by clicking on the View/Download mp4 button below the image. Depending on its settings, your browser will either show the movie or download it. The mp4 movies will also be regularly updated as new images arrive, but are not automatically updated on your browser. Transits were important for two developments in astronomy, that Kepler's theory using ellipses for planetary orbits was better than the Ptolemaic theory and fixing the size of the solar system. Transits of Mercury and Venus can happen because they are the two planets that orbit between the Earth and the Sun. By using ellipses to describe the orbits of the planets Kepler was able to predict when transits would occur. The Ptolemaic theory that used circular orbits did not have the accuracy needed to do predict these events, even after epicycles and equants were introduced. In 1627, Kepler predicted that a transit of Mercury would occur on November 7, 1631. Pierre Gassendi watched from his Paris observatory and saw a small black dot move across the face of the Sun on that day. A real triumph for the Kepler calculations! Later transits, especially of Venus, would be used to measure the distance between the Earth and the Sun — the astronomical unit that we now know is 149,597,870,700 meters (or 92.75 million miles). But on May 9, 2016, we celebrate the success of Kepler's ideas. As we watch Mercury move across the Sun, you could also remember our successes in using Kepler's ideas to slingshot the Voyager spacecraft through a Grand Tour of the outer planets, or to use Jupiter to send the Ulysses spacecraft high above the poles of the Sun, or even the incredible accuracy of GPS positions we take for granted as we move about in our everyday lives. You can safely watch the transit at http://mercurytransit.gsfc.nasa.gov. My thanks to the SDO scientists, engineers, and web programmers that make this SDO Data Event possible. Never look at the uneclipsed Sun with unprotected eyes! Always use sun-safe optics to look at the Sun. 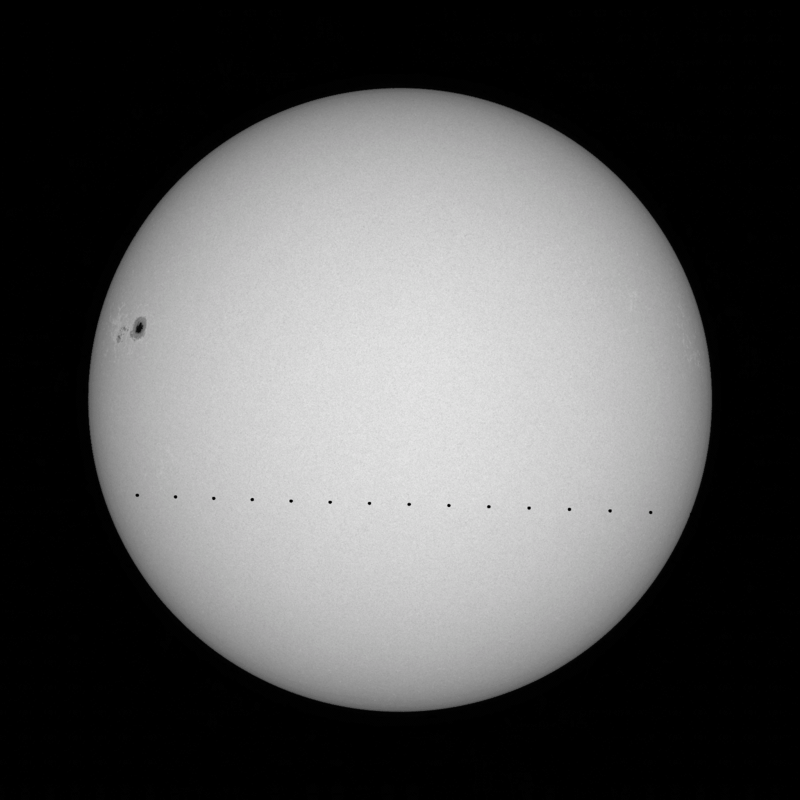 Why is Mercury Bright in Some Images During the Transit? While watching the transit of Mercury across the Sun on May 9, 2016, at http://mercurytransit.gsfc.nasa.gov we will sometimes see that Mercury is not black but glows a little. We also saw this during the transit of Venus in 2012, especially when Venus entered and left the disk of the Sun. We use these “bright planets” to study the telescopes on AIA. Most of the light from the Sun is visible wavelengths. By most I mean sunlight at visible wavelengths is 1 million times brighter than the ultraviolet and extreme ultraviolet wavelengths measured by AIA and EVE. Those instruments use filters on the front of their telescopes to keep the visible light photons from reaching the CCDs. The filters on the AIA telescopes are thin metal foils that are supported by meshes. The rows and columns of the meshes are rotated about 45° from the top of the Sun and are separated by a rotation of about 10°. Unfortunately, the mesh grid diffracts photons and a point of light is seen as a pattern like the image on the left. 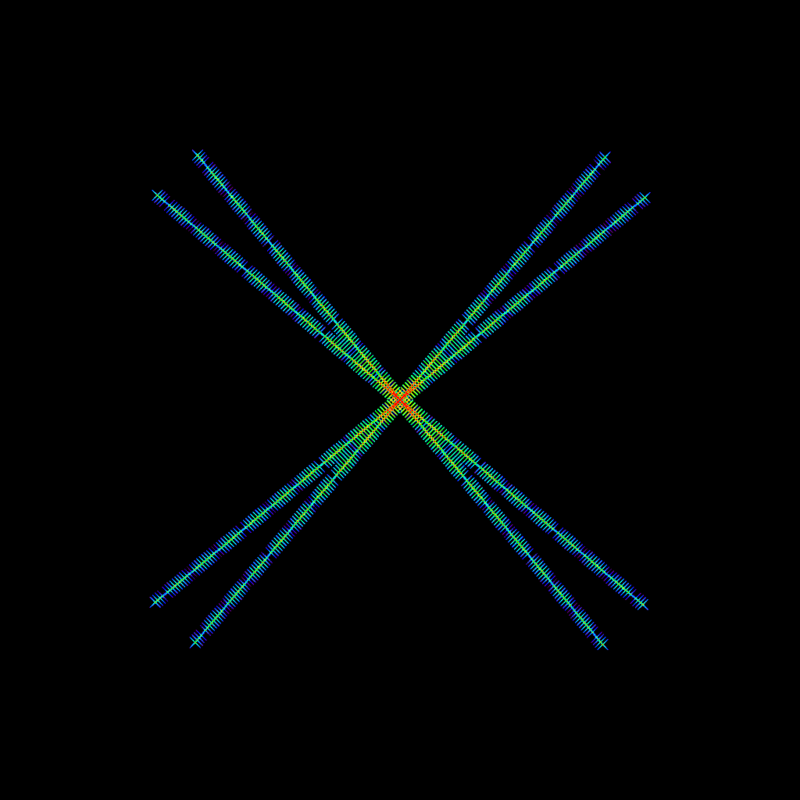 This image represents the 171 Å “point spread function,” or PSF. For the 171 Å images, almost 2/3 of photons end up in the “correct” location, at the center of the crosshairs. But 1/3 of the photons are diffracted to other places in the image. 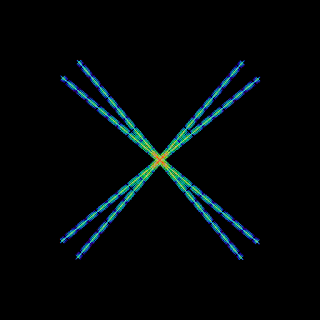 The amount of diffraction is wavelength-dependent, so each image has its own corresponding PSF. However, the pattern in each wavelength is similar to the one on the left. Planet transits can be used to calibrate that software by providing a disk that should always be completely black but sometimes isn't. You might remember seeing the PSF pattern as the eight-spoked pattern can appear over a flaring location (like the AIA 131 Å image from August 2014 on the left). The important thing to remember is that this pattern is not happening on the Sun - it is caused by the telescope. Even better, we can use software to “put” the light back into the right place. Mercury, which will be roughly 36 million miles from the Sun at the time of the transit, should appear completely black against the solar disk. However, photons diffracted from the filter mesh may make Mercury appear temporarily brighter as it passes through a diffraction pattern from a particularly bright region. The AIA team used observations from the Transit of Venus in 2012 to refine their understanding of the PSF and improve our ability to apply the correction to the science data. It is hoped that we can once again take advantage of a should-be-dark planet to further calibrate our images. Not to worry, we will get another chance to verify the calibration during the next Mercury transit on November 11, 2019! For about 9 hours starting at 1030 UTC (6:30 a.m. ET) on May 9, 2016, SDO will watch a small black dot move across the Sun. The black dot won’t be a sunspot, it will be the planet Mercury making a rare transit of the Sun. 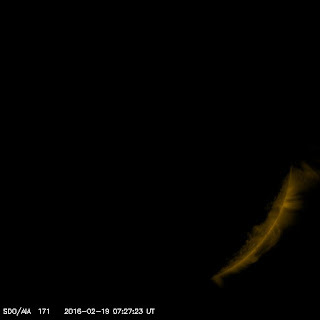 We will be providing a near-live feed of the SDO images of the transit at http://mercurytransit.gsfc.nasa.gov. The images are delayed a few minutes by the data delivery method, but our website will display the data as self-updating movies. The movies will include a visible channel and most of the EUV wavelengths. You pick the box and wavelength and watch the transit unfold! 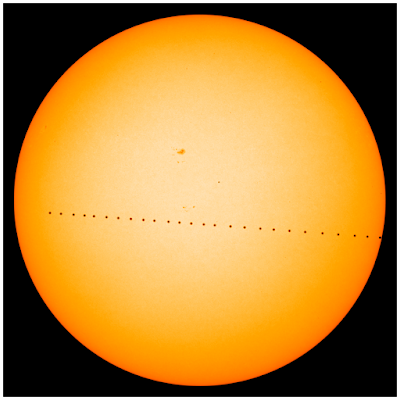 The image at the left shows Mercury’s position during the transit plotted on an AIA 193 image from April 9, 2016. The black circles are about the size of Mercury and are spaced 30 minutes apart. Along with the full-disk view of the Sun we will provide several zoomed views. These views are shown by the boxes that are drawn on the image. You can also see that the EUV telescopes will see Mercury blocking the corona about an hour before it moves onto the disk. All of the boxes are built in a 16x9 ratio that nicely fits into an 1080p screen. Images will be shown as short movies in your browser that update every few minutes to include the latest data from the satellite. The next image is a movie from our testing in AIA 171. Coronal loops and active regions provide an ever-changing background to the circle with a white cross that was drawn to represent Mercury. Compared to people on the Earth, the orbit of SDO causes the transit to start and end at different times as seen at SDO. The transit starts when SDO is further from the Sun and ahead of the Earth and ends with SDO in front of and closer to the Sun-Earth line. Even though the Mercury transits were less useful for measuring the size of the solar system, they are fun to watch. You can also compare how the different telescopes on the ground and in space see the black dot of Mercury move across the Sun. Maybe, just maybe, Mercury will pass over a flare! Never look at the uneclipsed Sun with unprotected eyes! You can safely watch the transit at http://mercurytransit.gsfc.nasa.gov. My thanks to the SDO scientists, engineers, and web programmers that make this SDO Data Event possible. During April 2016 we celebrated the entry of four Ph. D.'s into the research community. A record number of four graduate students received their Ph.D.s in April 2016 for research that used SDO data. Their dissertations will join the 27 that have already appeared over the life of the SDO Project. Nishu Karna, George Mason University, A Comprehensive Study of Cavities on the Sun: Structure, Formation, and Evolution. Congratulations to each new Ph.D. Try to enjoy not being a student! SDO successfully executed momentum management maneuver #25 on Wednesday. Between 1815 and 1845 UTC (2:25 and 2:45 p.m. ET) science data may be missing or blurred. Next Wednesday, the EVE Cruciform! SDO will perform the EVE Cruciform and HMI/AIA Flatfield maneuvers today starting at 1315 UTC (9:15 am ET) and lasting until 1900 UTC (3:00 pm ET). During the maneuvers the SDO images may be smeared by the motion of the spacecraft. 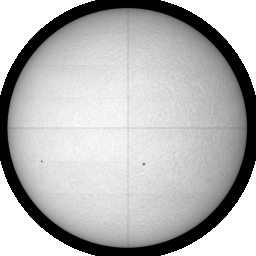 Some partial images may be seen as the AIA team tests the Mercury transit mode in their cameras. Between 1120 and 1845 UTC (7:20 am and 2:45 pm ET) on May 9, 2016, SDO will watch a small black dot move across the Sun. The black dot won’t be a sunspot, it’s the planet Mercury making a rare transit of the Sun. The top image shows Mercury’s position during the transit plotted on an HMI continuum image from April 9, 2016. The black circles are about the size of Mercury and are spaced 30 minutes apart. We will be providing a near-live feed of the SDO images of the transit on the special website http://mercurytransit.gsfc.nasa.gov. Our feed is delayed a few minutes by the data delivery method, but our website will display the data in a self-updating movie format. The stream from the spacecraft will include a visible channel and most of the EUV wavelengths. Compared to people on the Earth, the orbit of SDO causes the transit to start and end at different times as seen at SDO. The transit starts when SDO is behind and ahead of the Earth and ends with SDO in front of and close to the Sun-Earth line. While Mercury moves across the face of the Sun we will provide several ways to look at the data. Along with the full-disk view of the Sun we will provide several zoomed views. The second picture shows the boxes where small movies will be published on an AIA 193 image from April 9, 2016. The top part of the image will be cutoff so that no compression is needed to send the images to the ground. You can also see that the EUV telescopes will see Mercury blocking the corona about an hour before it moves onto the disk. Images will be shown as short movies in your browser that update every minute or so to include the latest data from the satellite. We will see the disk of Mercury against the corona in the EUV channels about 1 hour before Mercury gets to the edge of the Sun. SDO scientists will use the Mercury transit to study how the Sun is oriented on the cameras. It will also be used as a test of the computer programs used to clean up stray light in the images. This stray light caused ghost images to appear inside of Venus during the 2012 Venus transit. The disk became black when the computer programs were used to analyze the images. Mercury’s disk appears smaller and it is a better test of the programs. A Mercury transit was the first seen in history. The heliocentric theory of the solar system allowed the orbits of planets to be more accurately calculated and Johannes Kepler determined that a transit of Mercury was possible in 1631. Pierre Gassendi saw that transit on November 7, 1631. Transits of Mercury across the solar disk are more frequent than transits of Venus. This is because Mercury’s orbital period is 40% of Venus. But Mercury is farther from the Earth during a transit and the shift of the transit path for observers at different latitudes is smaller than for Venus. This made the less frequent Venus transits a better source of data for measuring the distance from the Earth to the Sun (1 AU). Mercury is smaller in radius than Venus and further away from the Earth. That makes the disk of Mercury smaller on the Sun and more difficult to see as it enters and leaves the solar disk. The times of these contacts are needed for measuring the size of 1 AU. Again the Venus transits are a better measurement of 1 AU. Even though the Mercury transits were less useful for measuring the size of the solar system, they are fun to watch. You can also compare how the different telescopes on the ground and in space see the black dot of Mercury move across the Sun. Never look at the uneclipsed Sun with unprotected eyes! Always use sun-safe optics to look at the Sun. You can watch the transit at our special website. My thanks to the SDO scientists, engineers, and web programmers that make this SDO Data Event possible. SDO is again flying with solar north pointing in the right direction. The data we took over the past 25 hours will help HMI better understand their data. Many thanks to everyone who made this maneuver successful! SDO has rolled 180° and will remain in that attitude until 2000 UC (4:00 pm ET) tomorrow. Some Water and an HMI Roll Please! Today is World Water Day, when we think about how important water is to our lives. Without clean water we cannot survive, so take a minute to remember all the people who bring clean, fresh water to your house. But water also plays an important role in the far future of the Earth. Right now the average temperature of the Earth is a comfortable 60°F. This is a balance between the heat coming from the Sun and the heat lost by the Earth. That temperature would be about 280 K (45°F) without our atmosphere. It would also be very hot in the day and very cold at night. The Earth's average surface temperature is higher (and varies less) because we have an atmosphere that retains some of the heat. Water and carbon dioxide are the main gases that warm the planet's surface. That delicate balance will be affected by the increase in the solar irradiance over the next billion years. At that time the average temperature of the Moon will exceed the boiling point of water. The effect on the Earth could be quite dramatic. The oceans will evaporate and we will have a steam atmosphere whose surface temperature will cause rocks on the surface to break down. The actual calculations depend on the details of the solar input and how steam (or water) stops heat from leaving the atmosphere. And water plays a role in the ultimate fate of our planet. When the Sun exhausts the hydrogen fuel being used to create heat in the core, it enters new stages of evolution. One of these is to become a red giant star, whose size can reach 1 AU (the Earth's orbit) or larger. Rather than a small dot in the sky the Sun would be huge red disk! A red giant is very cool (compared to today's Sun) and molecules such as water can form in the atmosphere. The actual size depends on how that water interacts with the light becoming from inside the Sun. Changing how water interacts can shrink the red giant so that it encompasses Venus or enlarge it to encompass Mars. So, on World Water Day, it is good to think how important water is, both to our lives today and the Earth tomorrow. 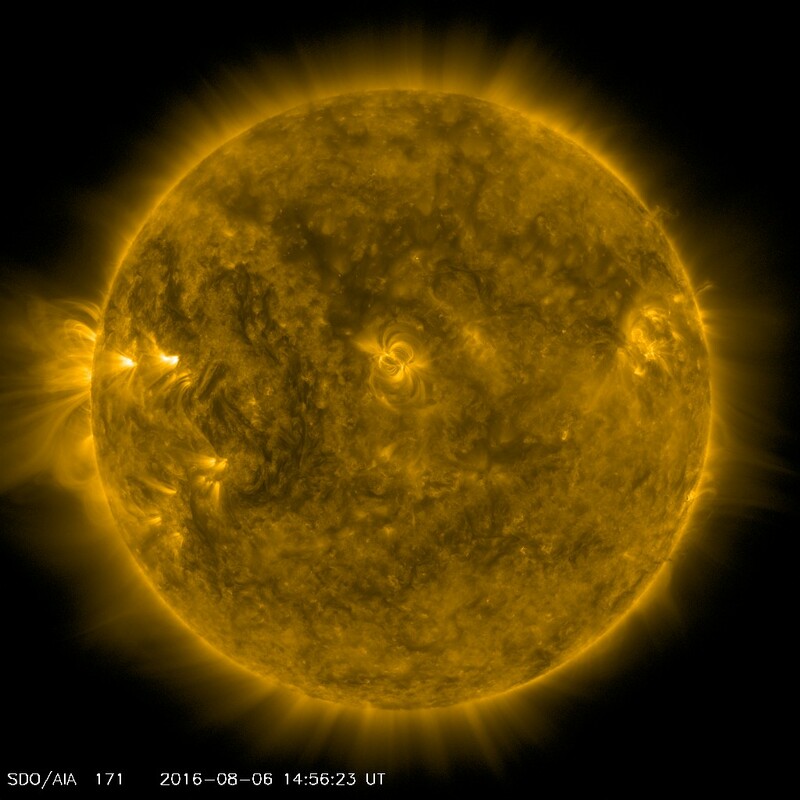 On an operational note: We will roll SDO 180° tomorrow for 25 hours starting at 1900 UTC (3:00 pm ET). This is designed to help the HMI team understand how their data is behaving. Some SDO near-realtime data may be upside down for awhile as the data system adapts to the new attitude. The Kiosk, or Self-Updating, movies no longer work if started from a .html file on a machine other than the SDO server. They do work if they are started from the SDO website (such as by clicking the link at http://sdo.gsfc.nasa.gov/data/kiosk.php. This is related to a website security update. Frames from outside the sdo.gsfc.nasa.gov domain can't initiate an iframe without having that specific website on a whitelist. We are working to deliver the same functionality without having to maintain that whitelist. Until then, please use the three examples on the kiosk webpage. Here is the 100,000,000th image seen by HMI! 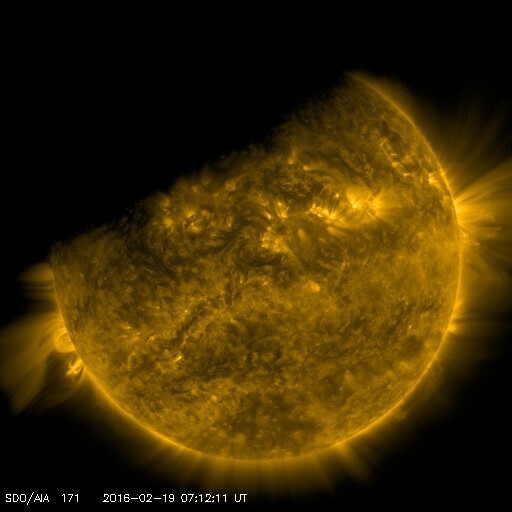 It was snapped yesterday (March 8) at 0453 UTC (11:53 pm ET on March 7). Unlike the 100,000,000th AIA image we talked about last year, most people don't look at the individual HMI images. HMI images are processed and manipulated to make Dopplergrams and magnetograms. My congratulations to the Stanford and LMSAL team that built and now run the HMI instrument. The Dopplergrams, magnetograms, and intensitygrams that we see everyday are the result of their excellent work. They are used by space weather forecasters around the world to track what the Sun is doing. The Dopplergrams have been used to look at how material moves around deep inside the Sun's convection zone. Another 100,000,000 HMI images please! SDO's Spring 2016 Eclipse Season started on February 19, 2016, with the Earth passing between SDO and the Sun at 0712 UTC that day. The top picture shows the Earth moving across the Sun in an AIA 171 Å image while the bottom picture shows the Earth almost covering the Sun 15 minutes later. Eclipse season runs through March 12, 2016. On Wednesday, March 2, 2016, SDO will execute stationkeeping maneuver #12 at 2250 UTC (5:50 p.m. ET). Science data will be unavailable for about 45 minutes starting 2235 UTC. These maneuvers are used to help SDO be a good neighbor in the geostationary belt that we pass though twice each day. Today is the 6th anniversary of the SDO launch. I was looking for a good picture or movie when this came in my email. It says it all. Happy Birthday SDO. What a great mission. Last Wednesday SDO did the HMI/AIA roll maneuver, where the satellite spins around to help the scientists better understand the instruments. Here's an example of an image during the roll at 1523 UTC. With the south pole on the left, the filaments look a little like a cat or harlequin! This afternoon SDO will do the EVE cruciform, moving in a plus sign figure to measure how light reflects inside the instrument. From 1800-2300 UTC (1:00-6:00 pm ET) the Sun will appear to move around and be blurry. Enjoy! Since Monday there have been several interruptions in the SDO website and data flow. On Monday a test of the Inertial Reference Units resulted in SDO pointing slightly off center for about 90 minutes. Some data may not be created during that time. On Monday and Tuesday our system administrators were updating the SDO website and, perhaps in anticipation of their impending replacement, one of the older RAIDs failed. There have been several interruptions as the SAs repair the issues and these will continue this week. 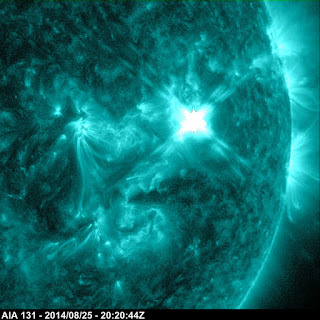 SDO data continues to flow to the data centers. 2015 was a great year for SDO! We finished our prime mission and began the first extended mission. Several hundred scientific papers appeared describing SDO data. And we made it onto several "Best Of" lists and magazine covers in 2015! Many of these were for the excellent 5th Year movie showing how the Sun changed over the prime mission. SDO was built to show us how the Sun changes in time and having the movie be a "Best Of" image means we doing just that. My favorite image of 2015 was the transit eclipse on Sept. 13, 2015. Here is an example of what that looked like in AIA 171. The sharp curve on the left is the Moon and the blurry curve at the top is the Earth moving out of the way. It was the first transit eclipse seen by SDO (probably a first for NASA) and the only lunar transit seen by SDO that was also seen as a solar eclipse on the Earth. Check out the movies of the transit eclipse at NASA. I want to thank and congratulate the great team that works to keep SDO data and science flowing. Even after almost 6 years in orbit SDO is GO!